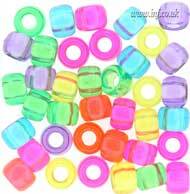 Transparent bright colours plastic medium sized barrel beads. Also called pony beads or hair beads. Size 9mm diameter 6mm height with a 4mm hole diameter.